More than two centuries after July 4, 1776, the men who signed the Declaration of Independence — especially John Hancock — are famous. But the woman whose name also appears on the document, or at least on one version of it, is not as well known. Mary Katherine Goddard was the printer and postmaster to the Second Continental Congress in Baltimore, and she may have been the first female postmaster in colonial America, according to the Smithsonian. Publishing was the Goddard family business. Her younger brother started the Providence Gazette, Pennsylvania Chronicle, Maryland Journal and the Baltimore Advertiser. When he moved on to other business ventures, Mary Katherine stuck with it and started publishing the Maryland Journal as “M.K. Goddard.” That same year, in 1775, she was appointed postmaster of Baltimore. In Goddard, the Founding Fathers found someone who was on the same wave length as they were — radical, and revolutionary for her time. When British troops got dangerously close to Philadelphia, the Continental Congress evacuated to Baltimore and made the Henry Fite House their headquarters, from Dec. 20, 1776, to Feb. 22, 1777. During that two-month period, Mary Katherine Goddard was not only publishing a newspaper, but also overseeing delegates’ mail and the printing of Congressional documents. Goddard published a version of the text of Declaration of Independence for readers of the Maryland Journal just a few days after July 4, but six months later she was asked to print a particularly important edition of it. 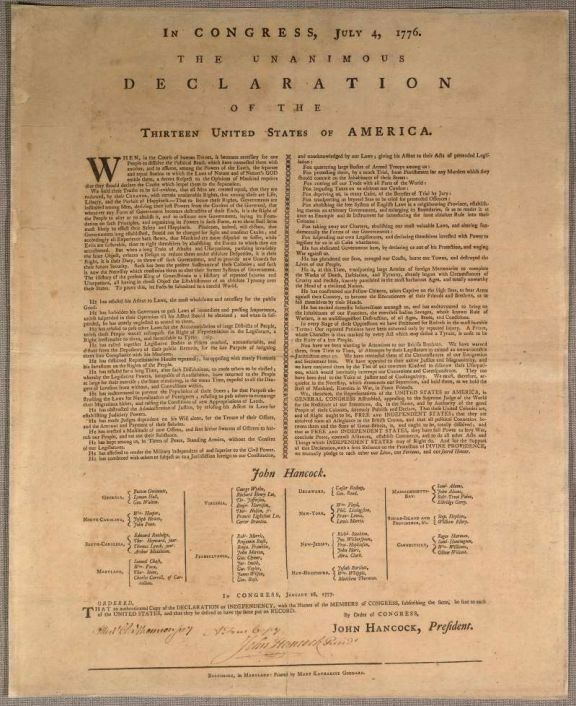 Among the milestones that this printing represents, it’s the only “official” version printed by a woman, the first that lists (most of) the signers — 55 out of the 56 signers are there, sans Thomas McKean, who is thought to have signed the document later — and the first to be entitled “The Unanimous Declaration of the Thirteen United States of America.” Ten copies of this document, which has also been called the “Goddard Broadside,” survive nationwide. As there is not a more distinguished event in the history of America, than the Declaration of her Independence,—nor any, that in all probability, will so much excite the attention of future ages, it is highly proper, that the memory of that transaction together with the causes that gave rise to it should be preserved in the most careful manner that can be devised. I am therefore commanded by Congress to transmit you the enclosed copy of the Act of Independence, with the list of the several Members of Congress subscribed thereto;—and to request that you will cause the same to be put upon Record, that it may henceforth form a part of the Archives of your State, and remain a lasting testimony of your approbation of that necessary and important measure. And Goddard took a huge risk printing the document, too. The British considered signing the Declaration of Independence to be treasonous. As Georgetown law professor Randy Barnett has explained, “The Declaration constituted high treason against the Crown. Every person who signed it would be executed as traitors should they be caught by the British.” As postmaster, Goddard was also believed to have paid post-riders out of her own savings during the American Revolution. But the British wouldn’t be the ones to force Goddard to leave the job. That dubious honor would go to the leaders of the new American government, ironically. Her patriotism during the Revolution appeared to be disregarded after the ratification of the Constitution. The nation’s first Postmaster General Samuel Osgood forced her out as postmaster in 1789. The official reason was because there was going to be more business travel in the position, and that might overwhelm a woman. But historians believe it’s more likely that Osgood wanted to appoint a political ally to Baltimore postmaster instead; the Smithsonian describes her as “one of the new Republic’s earliest victims of what would become known in the nineteenth century as the postal service’s patronage system.” Friend and colleagues signed a petition to reinstate her, and Goddard appealed to George Washington, but he refused to intervene. Historians think that may have been because she socialized with his opponents, the Anti-Federalists. Goddard ended up running a shop selling dry goods, stationary and books up until her death on Aug. 12, 1816; her will freed her slave, Belinda, and left Goddard’s possessions to her.